From the origin to the legal recognition. Collaboration with the Chigiana Academy. The Equated Musical Institute “Rinaldo Franci” developed with the approval of the Municipal council of Siena on 27th January 1834 as “School of Music and Solfeggio” of the Municipal Band. The Institution of the school had been proposed by Rinaldo Ticci, who was director of the Municipal Band and of the school for fifty years. In the 1840, in addition to introduction of the winds and the solfeggio teachings, had been added the violin’s lessons. In the 1851 was deliberated the obligation of doing two times per year – on Carnival day and on August – the exhibition of the students, so called annual experiments”. From the 1879 to the 1895 the direction of the School and of the Band was given Pietro Formichi, who was the player of the chapel of the Dome and prolific composer (Masses, Requiems, more than hundred compositions for piano, in addition t the popular march of the Palio). In the 1895 the direction was given the violinist Rinaldo Franci (1852 – 1907), concert performer famous in Italy and abroad and of which in succession of the School that will take the name. With the new century, the school becomes the keystone of the musical life of the city. In the postwar period developed the cooperation of the School with the newcomer Chigiana Musical Academy. In fact, one of the most important reforms of the “Franci School” developed around 1921 when there was the idea to create a Musical Institute for the city of Siena. So it was that with the reform of 1923, in addition to the courses with bowed string instruments and of solfeggio (musical theory), had been instituted the winds ones, as long as it will be created the course for the piano. The director of the School in charge was the Prof. Cav. Piero Baglioni owner of the course of violin and the superintendence was given the Count Comm. Guido Chigi Saracini. (by the article of A. Vigni in La Balzana anno X, july-august 1932, n. 4). It was the initiative of some teachers of the Franci School, that developed the Quartetto Senese, protected and estimated by the count Guido Chigi Saracini. 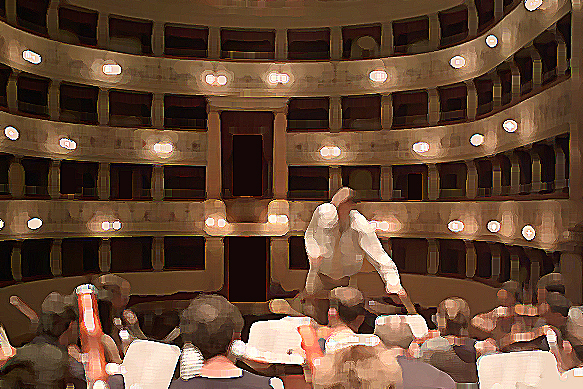 Besides, for the first editions of the courses of direction of orchestra of the Chigiana Academy was held by Alfredo Casella and by Antonio Guarnieri, the Academy availed itself of the collaboration of the Orchestra Society of Siena (Società Orchestrale Senese), chiefly composed by the teachers and by the students of the Franci School, profitable collaboration which lasted until the 30’s. the count Guido Chigi Saracini continued to be the Superintendence of the Musical Insitute until his death. In the 1941 with the decree of the Ministry of the National Education, the Institute was legally recognized with the effective date from the 1st June 1940. The collaboration with the Chigiana Academy went ahead also after the Second World War. In the 50’s, for initiative of Vittorio Baglioni, vice-president of the Chigiana Academy and director of the Institute since he was alive, studied in the Institute itself a complex of bows – first entitled Rinaldo Franci, then denominated Complex of Chamber Music of Siena and so Orchestra of Chamber Music of Siena – directed, after Baglioni, by Pier Narciso Masi, Riccardo Brengola, Marco Fornaciari e Fabio Pacciani. The equality to the conservatories. Center of the permanent education in musical subjects registered in the AFAM project (Artistic and Musical High Education, law 508/1999, DM 8 January 2004) of the Education’s Ministry, of the University and of the Research. On 31th December 1985 , under the direction of Giuseppe Papi, the Institute gets for administrative order of the President of the Republic the equality to the conservatories of State and from the following year it could take the examinations of State for its own students and for the external ones like all the conservatories of Italy. After that moment on, the history of the Institute was evolving little by little gaining even more a wider range: an Institution which opens up and avails itself of musicians and teachers coming from every city of Italy and from the world (Poland, Germany, Argentina, England, etc.). From that date, a lot of students had educated (almost 400 students), most of which are today concert performers or have a relevant role in important orchestras (Orchestra of the Theater Carlo Felice of Genoa, Orchestra of the Maggio Musicale Fiorentino, Orchestra of the Theater The Phoenix of Venice, Orchestra of the Opera of Montecarlo, Israel Philharmonic Orchestra, etc.). In the field of its recent history the law 508 of 1999, with which also the Musical Institute “Rinaldo Franci” enters the project of reform of the Conservatories and the Equated Musical Institutes like “Superior Institute of Musical Studies” (art. 2 comma law 508/1999) according to the directives of the Education’s Ministry, of the University and of the Research, Artistic and Musical High Education, establishes certainly another important phase. From 2001 the Institute got itself a Choir and an Orchestra chamber music composed by students and teachers. In addition to gain the equality of the teaching post of the guitar, viola and composition, organized seminaries and masterclass held by the musicians of international fame (Bruno Canino, Emilia Fadini, Andrea Lucchesini, Pietro De Maria, Cristiano Rossi, Francesco Libetta, etc). In 2004 the municipal administration and the Equated Musical Institute “Rinaldo Franci” create the institutional Orchesta of Siena “Rinaldo Franci” composed by students, teachers and orchestrals: an orchestra for the city of Siena. From 2004 the Musical Institute organizes two-year experimental courses for the achievement of the academic degree of second level in musical subjects (ministerial decree AFAM 8 January 2004): with this ministerial authorization, the Institute can release a higher title of musical study of the Italian State. The Musical Institute “Rinaldo Franci” has never neglected the music for the children, the musical approach in the schools (especially primary schools and middle schools) and the concert lessons of their teachers.